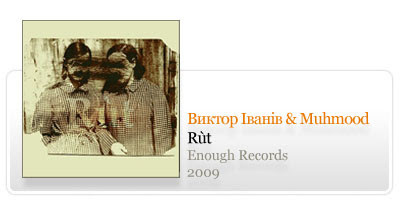 An EP collaboration of two Siberian artists - Виктор Iванiв (Victor Ivaniv) is a futurist poet from Novosibirsk. Muhmood is Alexei Biryukoff’s one man project from Barnaul, experimenting with ambient soundscapes, noises, field recordings and heavy guitar music. They met in November 2007 when Victor came to Barnaul with a presentation of his book “A Glass Man and the Green Record”. At that time they decided to try to do 2 or 3 tracks to see what would come out. By June 2009 the four tracks EP is done. They continue to work on a long playing album that will include Victor’s poems and prose.